Pictured from left: Rotarian Linda Rossiter, Mary Corriveau and Jim Corriveau. 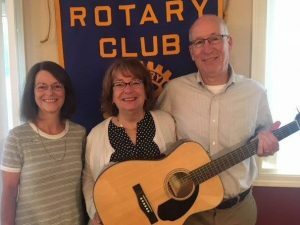 FULTON – At a recent Fulton Sunrise Rotary meeting, Mary and Jim Corriveau presented the morning’s program. They are very active in the Watertown’s Guitars for Vets (G4V) program. The G4V mission is focused upon helping Veterans who struggle with physical injury, trauma and PTSD. The belief is that by learning guitar and experiencing music, the vets may find a path to greater joy and serenity to better cope with their life challenges. This is a nationwide program that started 11 years ago. All vets are provided guitars, lesson books, weekly private lessons and monthly group workshops all at no cost. All funding for the program is through donations from the community. To date, G4V has given more than 29,000 lessons and distributed more than 2,900 new guitars to veterans.